I am writing this guide as an aide for my clients and others who want to file an application for the family violence education program to resolve their domestic violence case. Also, in many situations State’s Attorneys may suggest to clients that they should resolve their cases by filing for the family violence education program. Top Stamford domestic violence defense attorneys will tell you that you do not want to always jump into applying for this program as it has several significant disadvantages which I will discuss at length. However, in some cases it is the best possible resolution of the charges which you are facing. The decision of whether to file for the family violence education program is a tactical choice that can only be made based on a determination of all the facts of your individual case. Before you make the decision on whether this program is the best resolution for your domestic violence case you should have a detailed consultation with an experienced Stamford domestic violence defense attorney. The Family Violence Education Program is a two part program which is administered by the family relations pre-trial supervision services. The program is created by a state statute and the reference is Connecticut General Statutes Section 46b-38c(h)-(i). The ultimate decision on whether or not to grant you entry into the program rests with the Judge who will listen to input from the State’s Attorney, and the victim and of course your defense counsel. It should be noted that you only get one opportunity to make your presentation to the Court. So preparation in advance and a good presentation are the key to a successful application for the family violence education program. If the Judge turns you down there is no appeal or second chance so you want to get it right the first time. It is a so called “diversionary” program which means that it diverts the case from the traditional path of a criminal prosecution and transfers the case into a more rapid and streamlined process. In Connecticut we have many so called diversionary programs available for various situations, typically only available for first time offenders. The first part of the family violence education program is an educational component which consists of 9 classes which focus on the impact of violence upon relationships. These classes generally meet once a week for 9 weeks. The second part of the program is “supervision” by family services for a period of up to two years. The terms of the “supervision” usually involve just staying out of trouble and not picking up any new arrests until your period of “supervision” has expired at which point the charges against you would be dismissed. In most normal cases the courts impose one year as the period of “supervision” for family violence education program applications but in cases involving weapons or more serious allegations the Courts have been known to extend the period of “supervision” out to the full two years. In addition, in those more serious cases the Courts have also been known to impose additional conditions upon the “supervision” such as substance abuse evaluation and treatment; mental health evaluation and treatment; therapy sessions; and anger management therapy. The cost of the program is $400 which is broken down into a $100 application fee and a $300 program fee payable if the program is granted. What Are the Benefits of Using the Family Violence Education Program? The program does have some significant advantages that you should seriously consider. However, it should only be used as a last resort after all other alternative options have been exhausted. The main reason for this is that you can only utilize this program once in your life time so you want to save it for use at a later time if at all possible. There are other reasons why you would want to hold off on using the program and I will discuss those in the next section. The main benefit of the program is that the charges against you are dismissed at the conclusion of the program and you do not have to face the exposure of a trial and possible conviction. Taking your case to trial involves significant delays, costs and always the uncertainty of what the outcome will be when you are placing your fate in the hands of a jury. By using a diversionary program such as the family violence education program you remove all the uncertainly of taking your case to a trial and you have control over your destiny knowing that if you just complete the program requirements your charges will all be dismissed at the completion of the program and you will have no criminal record. You can only use the family violence education program one time in your lifetime. You want to make 100% sure there is no other alternative way to work out a negotiation with the State’s Attorney to get your charges dropped or “nolled” before you resort to applying for the family violence education program. It is always better to keep the program as an “ace in the hole” in reserve in case you really need to use it one day in the future. The family violence education program only can be used for family violence crimes this means it can’t be used for other offenses that you have been charged with in the same incident which are not classified as family violence crimes such as – possession of a deadly weapon; interfering with a 911 emergency call; interfering with police; or risk of injury to a minor for example. Those kind of allegations would need to be addressed with another program called the accelerated rehabilitation program. Rather than using two programs which is sometimes required it may be possible to negotiate with the State’s Attorney to use only one program for some of the charges and get the State to agree to drop or nolle the remaining charges upon successful completion of the program. If you apply for the family violence education program your criminal orders of protection will remain in effect until you have completed the program which as we have discovered can take up to two years. This means that you remain exposed to allegations of violations of a criminal order of protection which are felony charges for a rather extended period of time. Of course it is always possible to modify the criminal order of protection to a less restrictive type. However, generally it is very rare for the court to agree to totally remove a partial order of protection (the least restrictive type) during the pendency of a case. This leaves you exposed to the possibility of false or fabricated claims on behalf of the victim resulting in not only new felony charges for violation of the criminal order of protection but in addition such an arrest would result in an unsuccessful completion of your family violence education program. For this reason, top Stamford criminal defense lawyers will always go the extra mile to try and negotiate a resolution of the charges that gets them dropped or nolled much more quickly than the family violence education program. There are many other alternatives to resolving NON SERIOUS domestic violence cases that do not require the use of the family violence education program. Sometimes, it may take a little more convincing by your defense counsel and a little more homework on your part going to some private anger management therapy sessions for example. However, in most of these type of non-serious domestic violence cases that did not result in any injuries in most cases alternative resolutions can be crafted which incorporate some form of private therapy and or charitable contribution or community service in exchange for the State agreeing to nolle or drop the charges which effectively ends the case without having to use the family violence education program. Of course in cases involving serious allegations of strangulation or assault with physical injury these kind of more mild resolutions are simply not going to be possible. For those who are employed in sensitive jobs or possibly considering seeking a new job in the near future the fact that your case is going to remain open for up to two years can be a significant problem if you have to pass a criminal background check. Obviously, if you fall into this category this is something you want to consider with your Stamford criminal defense attorney to determine what is the best plan for your situation. Needless to say anyone here on a visa or green card that needs to be renewed during the next two years should also factor that into their decision to utilize the family violence education program. The statute lists numerous requirements which must be met in order to utilize the program. These requirements are mandatory and can’t be waived. You can’t have any prior record or any conviction for any family violence crime which happened on or after October 1, 1986. This means that if you had applied to the family violence education program in the past and then were granted the program but failed it unsuccessfully then you are never the less precluded from ever using the family violence education program again for any other crime again in your lifetime. If you have decided that you want to apply for the family violence education program then it is best to be prepared and organized to present a professional presentation to the Court about why you should be granted the program. The first issue to consider when applying for the family violence education program that tricks up a lot of inexperienced lawyers is to make sure that your crimes are “family violence crimes.” Just because your case is on the domestic violence docket does not mean that all the crimes that you are charged with are family violence crimes and you can only use the family violence education program for those offenses that are actual family violence crimes. “Family violence crime” is defined in Connecticut general statutes section 46b-38a. A family violence crime means a crime that either results in some physical harm or injury such as strangulation or assault for example. However, a family violence crime is also defined to include a threat of physical violence that causes fear of injury or assault such as the crime of threatening of stalking. “Verbal abuse or argument shall not constitute family violence unless there is present danger and the likelihood that physical violence will occur.” Conn. Gen. Stat. § 46b-38a(1). Therefore, if you got into a verbal shouting match over who was supposed to take out the trash this week and were charged with breach of the peace or disorderly conduct then that would not be a family violence crime within the meaning of the statute. Similarly, any other non-domestic violence ancillary charges that are added on such as risk of injury to a minor or possession of a weapon for example would not be family violence crimes and you could not include those charges in your program application. Depending on the facts of your case, often State’s Attorneys have been known to make plea offers in which they agree to nolle or drop the non-family violence crimes upon successful completion of the family violence education program. Generally, these are very favorable offers and usually it is advisable to accept those arrangements when you are offered them. Of course every case is unique and every fact pattern calls for an independent review by an experienced Stamford domestic violence defense attorney to give you advice about your specific case. After your Stamford domestic violence defense attorney has obtained discovery of the police report and supporting witness statements and carefully examined the State’s case against you and exhausted every other possible means of having the case dropped or nolled and you are left without any other option except taking the case to trial then you are ready to submit your application for the family violence education program. When your case is called your attorney will advise the Court that you are making an application for the family violence education program. The application is made in writing on official form JD-FM-97 which can be obtained online on the Connecticut Judicial Branch web site. The Judge or Court Clerk will place you under oath and ask you a series of questions to determine if you meet the statutory eligibility for the program. It is very important to be very candid with the Court when answering these questions as any false testimony could be grounds for a felony charge. If you are unsure about the disposition of some case from New Jersey from 10 years ago and can’t recall the details then put that on the record. It is better to be candid and upfront about every detail. Once the Court is done questioning you the Court will assign a new date to return. During the interim the office of family relations will run a criminal background check on you to determine your eligibility for the program and also send notice to the victim of your application for the program. (Some Court’s require your Attorney to send the notice to the victim – it varies by location). The victim is entitled to address the Court and provide input as to whether you should be granted the program or not. Before you leave Court you will stop by the Clerk’s office and pay the $100 program application fee. Preparation is always the key to a successful presentation for an application to the family violence education program. While some applications are basically agreed to in advance by the State and will not meet with objection you can never anticipate what the Court’s opinion is going to be. Ultimately, since the Judge is the one who has the final decision on whether or not you are granted entry to the family violence education program it is always the best procedure to be prepared to make an effective presentation to the Court and convince the Court why you are a good candidate for the program and why the Court should grant the program on your behalf. In other cases involving more serious allegations involving physical injuries or strangulation, for example, often the State and or the Victim are going to be present objecting to the Court granting you the program and in those situations then the need for a strong argument and additional preparation and organization are even more crucial. Every case is unique and the argument to support your application needs to be customized to suit the circumstances of your particular case. You should always sit down in advance of the second stage hearing on your application with your Stamford domestic violence defense attorney and prepare for your Court hearing. Your attorney should know all the details about your family history, educational background, past criminal history (if any) details concerning the crime and any rehabilitative steps you have taken since the date of your arrest such as engaging in therapy or counseling. Reference or character letters from pastors, priests, professors, teachers, police offices, employers, neighbors, etc. A school transcript of your classes and GPA. A.A. Attendance sheets (If applicable). Proof of attendance at therapy for anger management or substance abuse issues while case was pending. Letter from an individual therapist attesting that you have been seeking therapy since the date of the arrest and that the issues that lead to the arrest have been addressed in the therapy and progress has been made. This list is just some examples, it is by no means exhaustive or all inclusive. I have to reiterate that every presentation for the family violence education program must be custom tailored to the specific circumstances of your individual case. Keep in mind that the Judge is ruling on these kind of applications each and every day and generally knows what kind of cases he or she is going to approve and which ones they will deny. If your case falls on the border line area the effective argument of your Stamford domestic violence defense counsel can make the difference to sway the Court to grant an application that might not have otherwise been granted. So what actually happens during the second stage of your application? The State’s Attorney will call your case and indicate that this is “second stage of the family violence education program.” The Clerk or a representative of the office of family relations will then report to the Court the results of the background investigation and indicate if you are eligible for the program. Next the Court will canvass the Courtroom to ascertain if any of the victim(s) are present and wish to be heard concerning your application. If you were found to be eligible then the State’s Attorney will read to the Court a brief summary of the facts of your case and indicate the State’s position on your application (whether they object or take no position on your application). Next the victim is given an opportunity to address the Court and provide his / her position on your application. In some cases where the victim can’t be present in Court the victim’s advocate may speak on behalf of the victim. Finally, it is your Stamford criminal defense lawyer’s turn to give a brief presentation regarding your life and convince the Court why you would make a good candidate for the program and why the Court should afford you the benefits of the program. Generally, the Court will rule on your application immediately from the bench but in some rare instances the Court may ask that you do some additional therapy, treatment or community service in advance before the Court will consider your application. (This is usually a good sign because it means that the Court is leaning towards granting you the program but wants you to do a little extra work before granting the application). In these situations you want a very experienced criminal defense attorney who is able to find just the right words to organize a brief, logical, reasonable and convincing argument on your behalf which convinces the Judge to grant you the program. One of the things your attorney is working on at the same time is laying the ground work to try and keep the Court from ordering the maximum two year period of supervision during this brief presentation because the very next thing that the Court is going to determine if you are granted the program is the length of the program and the conditions if any. D. Program Is Granted What’s Next? Congratulations all your hard work of preparation has paid off and you have been granted the family violence education program. The next thing that happens is the Court is going to determine the length of the period of supervision that you will be under which can last up to two years. Generally in most situations the Courts go with one year of supervision. If the case was particularly violent or if the victim came to Court to object and voiced concerns the Court may go with the full two years. Keep in mind that your criminal order of protection will remain in full force and effect until your final completion date when the case is dismissed. You must continue to abide by and follow the terms of the criminal order of protection while you are under the period of supervision by family services. Also at this time the Court may impose special conditions such as a requirement to pay restitution to the victim, requirements to attend therapy sessions, AA classes or other conditions that the Court deems appropriate. You must comply with and complete all special conditions of the program by the end of your period of supervision and when you return to Court otherwise your program will be deemed “unsuccessful” and you will be prosecuted for the underlying charges. At the conclusion of the hearing the Court will assign an anniversary date which is the date that you will return to Court to have your case dismissed if you have not picked up any new arrests and if you have successfully completed all of the special conditions the Court ordered. Before you leave Court you must stop by the Clerk’s office and pay the $300 program fee. Thereafter you need to go visit the office of family relations to sign up for educational component of your program which again consists of 9 classes. In some severe cases which are on the border line of acceptability for the family violence education program the State’s Attorney and in some cases the Court may suggest that they are willing to go along with the family violence education program but only under the condition that the additional enhanced 26 session explore program be ordered. This is a much more intensive 6 month program which meets once a week and has a much more demanding curriculum. Obviously this is a significantly greater commitment of time to complete such a program and if you miss more than two sessions in the 6 months you will be bounced out of the program and fail. Although this is a very uncommon scenario it is worth mentioning. Please be advised that this is just a brief overview of the family violence education program and some thoughts on the application process. There is no substitute for the counsel and legal advice of a Stamford domestic violence lawyer to give you sound legal guidance regarding your specific situation. 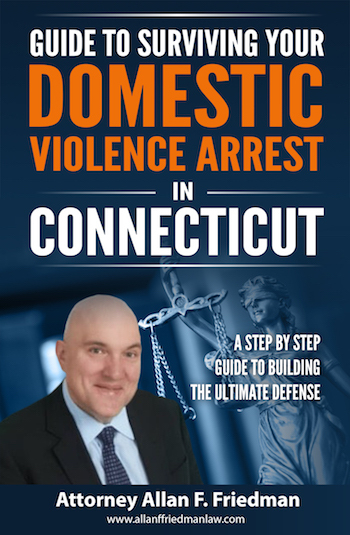 While an individual who is charged with a domestic violence crime does not have to retain a criminal defense attorney to file an application for the family violence education program, retaining an experienced Stamford domestic violence defense attorney could help make the difference between success and failure on your application for the family violence education program. Let Us Represent You in Your Domestic Violence Arrest! If you have been arrested for a domestic violence charge in Stamford, Bridgeport, Norwalk, Darien, New Canaan, Cos Cob, Greenwich, Fairfield, Weston ,Westport, Wilton, and throughout the County of Fairfield do not hesitate to contact the Law Offices of Allan F. Friedman. We work on a flat fee basis and our rates are reasonable. We offer payments plans as needed. Call Attorney Friedman at 203.515.4110 to schedule your free initial consultation we are available 24/7. Or you can contact us online for a prompt response.